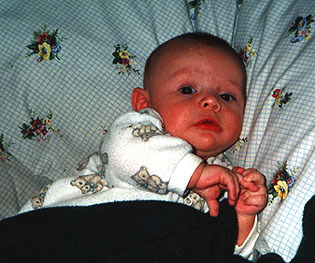 We brought Jake home from the hospital on August 16th, 1998 and since that day our lives have never been the same. 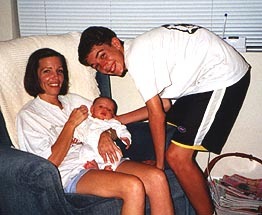 Becoming parents was tough in the beginning. We had to adjust to life without sleep and the fact that we were on call 24 hours a day, 7 days a week. We adjusted quickly and really enjoyed getting to know our new little angel. 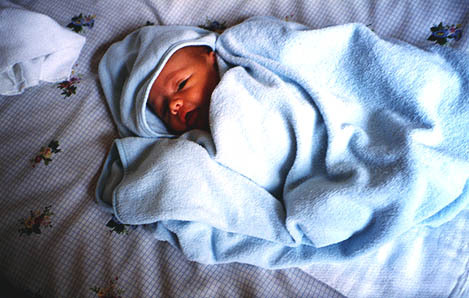 The joys we have known since we became parents far outway any complaints we could ever have. 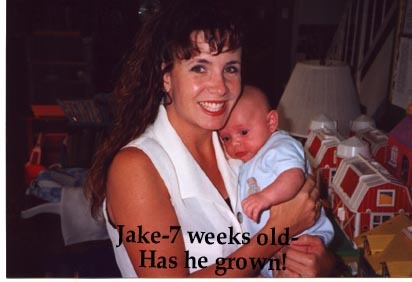 Jake's Birth Announcement picture. I took it after the bath one day and just fell in love with his little expression. 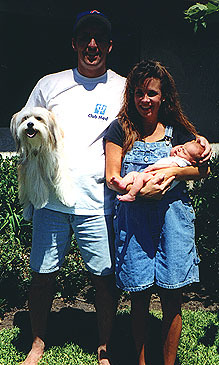 Family picture taken when Jake was one week old. Jacob and his daddy taking a nap. Aunt Julie and cousin Brandon are Jake's pals! Jake with his mommy at his 1st day of daycare. 7 1/2 weeks old. Jake with Terry, his daycare provider on his 1st day of daycare. Halloween! 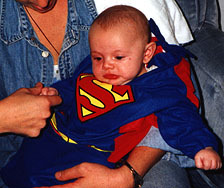 Jake was Superman for his very first Halloween. He looked adorable in his little costume. "I'm just hanging out in my mom and dad's bed. It's really cozy!" 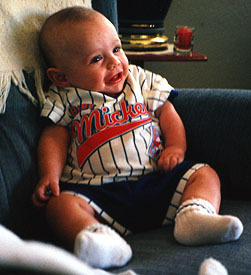 Sports fan from early on. Takes after his daddy! Our first Christmas with Jake was one to remember. He was fascinated by the lights on the tree and the presents below it. Although he wasn't much into opening his own presents, his mommy and daddy had loads of fun opening up all of his new toys and demonstrating them for him. We had a very joyous holiday. 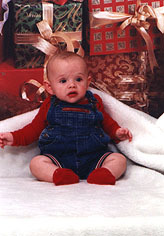 Jake was four months old in this picture. He has a smile that can light up a room, but he refused to smile for his pictures. He's still a cutie anyway. 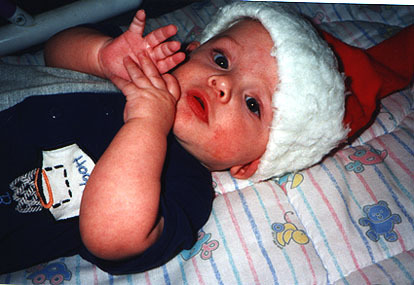 Looking very festive in his Santa Claus hat. 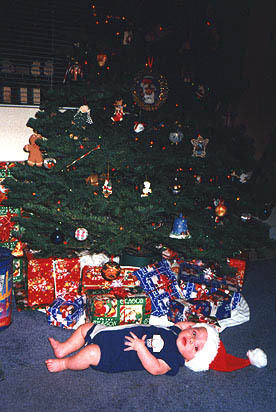 He just loved laying under the tree with the presents amazed by the colorful lights.